Pumpkin? Apple? Pecan? 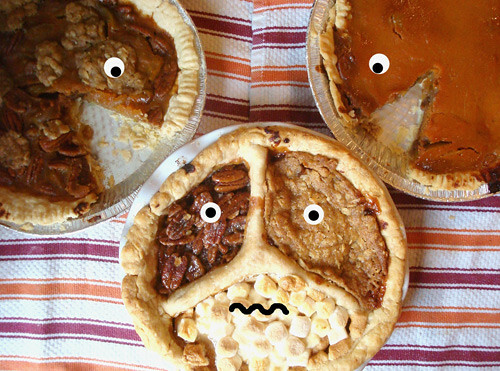 Why choose just one pie when you can have all three...at once? For this week's pie entry on Serious Eats, I bravely took on the task of testing out different ways of combining these classic pie recipes: in one pie, I layered the fillings one on top of the other; in another, I mixed all of the fillings together into one sweet slurry; and in the final (and--spoiler--best tasting) one I baked them in individual compartments. 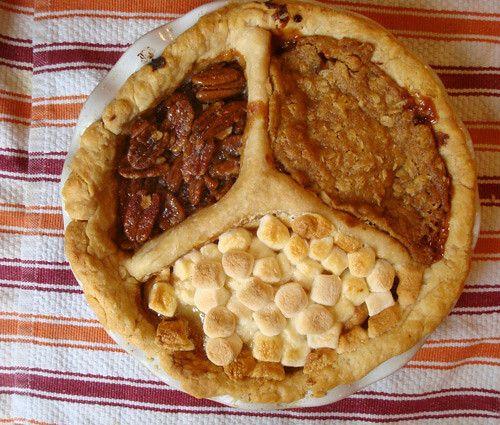 As it turns out, the peace-sign pie tasted the best. So why bother going to the trouble of baking them together? While baking in the same pie crust, each flavor gets a boost from being baked with the others--it lends a certain je ne sais quoi to the pie. Check out the full experiment, plus recipe, here.